Briquettes have long been the preferred fuel for barbecuing. 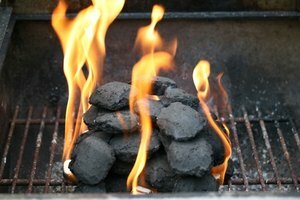 Charcoal and wood briquettes achieve a high heat, are inexpensive, and cook food quickly. Ceramic briquettes share many of these qualities, but they have the added benefit of lasting longer. Unlike charcoal, wood or lava rocks, ceramic briquettes don't absorb grease, so they cause fewer hot spots or flare ups in your grill. Ceramic briquettes are often used in gas grills. Open your gas grill and take out the metal cooking grid. Remove any old briquettes. Use a grill brush to sweep out any broken briquettes or ash. Arrange the ceramic briquettes in the bottom of the grill, placing them as close together as possible. Fill the bottom of the grill with briquettes. Replace the cooking grid. Clean your briquettes regularly to keep them performing well. 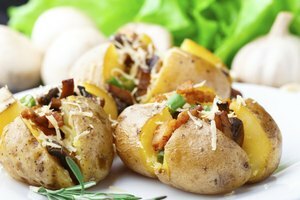 You'll know your briquettes need cleaning when they begin to heat unevenly or you notice flare-ups while cooking. If the briquettes aren't very dirty, simply turn them over and allow the crud to burn off during subsequent grilling sessions. Soak dirtier briquettes in a pail of vinegar for 10 or 15 minutes. Scrub with a soft brush. 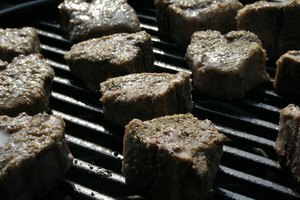 Rinse and allow to dry before replacing them in the grill. Replace the briquettes when you can no longer clean them effectively.